IK Multimedia introduces iRig Mic Lav, a compact lavalier microphone for mobile devices. Until the end of the year, Rode offers purchasers of one of their microphones the Red Giant PluralEyes audio/video sync software. The IK Multimedia booth will be the place to be at NAMM 2015 and, like every year, we met Star for a presentation of the iRig new products. IK Multimedia will showcase in a few hours at NAMM the new iRig Mic Studio condenser mic compatible with Mac/PC, Android and iOS devices. Following the guitar interface, IK Multimedia now offers vocalists the ability to record to their Samsung Android devices with a mic and apps. IK Multimedia unveils the stereo Field version of its iRig Mic for the Apple iDevices, designed to capture any sound around you. Blue Microphone will launch in the following weeks an updated version of its Mikey Digital iOS microphone with Lightning connector. Rode announces the availability of the new version of its iXY microphone for iDevices, which now can be used with the latest generations of iPhone. 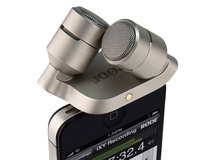 Besides its H1, H2, H4, and H6 recorders, Zoom has also conceived a microphone on a par with the excellent current generation of iPhone, iPod Touch and iPad.